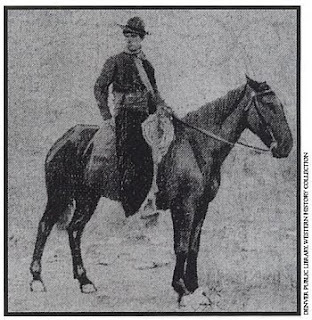 Joe Monaghan rode into Ruby City, Idaho Territory, on a quality mare in 1867. Like others there, he was looking for a bonanza at the gold and silver mines to create a new life for himself. Unlike the others, he was too young to grow a beard, slight of stature, and didn't carry firearms. Historian Mildretta Adams wrote, "A man could live a lifetime in the early days, known only by a nickname. His 'handle' may have been acquired by an incident in his life, his profession, or some distinguishing characteristic. By the same token a man could live and work among others, and be accepted at face value, and no questions asked about the past." The old-timers (those who'd managed to survive the harsh climate, high altitude, and heavy labor for a year), reckoned it would only be a matter of time before Little Joe headed back East with his tail between his legs, the same as most greenhorns. The rugged men of Owyhee County scoffed at greenhorns throwing down their shovels and heading for softer country. Little Joe, however, soon earned the respect of even the toughest of men because even though the work was back-breaking, he never faltered. As it turns out, the backaches and the blisters on his hands, didn't faze him, but the scanty findings soon forced him to seek other work, as with so many other optimistic miners. Soon, he quit his claim and went to work at odd jobs, then started raising small livestock and sold meat, milk, and eggs to the residents of Ruby City. He lived frugally in a small shack for several years, minding his own business and staying away from the bars and bawdy houses. Eventually, he took the lonely job of a sheepherder; later, a cattle hand. Eventually he settled down on a homestead ten miles from Rockville, Idaho. A responsible citizen always, he never missed voting in an election and always served on juries and posses when called upon. All along, he was known as an outstanding bronc buster as well as horse trainer, and wrangled the remuda on several roundups. He even performed as Cowboy Joe in Whaylen's Wild West Show: the Greatest Show on Land or Sea. Whaylen would pay $25 to any man who brought a horse that Joe couldn't ride. But after a year, Joe couldn't tolerate city life any longer and went back home to Rockville, where his closest friend and only company was his Chinese cook. When the cook died, Joe became even more withdrawn from friends and neighbors. In late 1903, Joe took sick and died in January, 1904, of a coughing fit. He was a SHE! The tough old ranchers had been fooled for over 30 years. Little Joe Monaghan--miner, bronc buster, and rancher--was a woman. The tiny town of Rockville was, well, rocked. News spread far with headlines splashed on newspapers across the nation. No one knows for sure exactly who Joe was. Anna Walters in Buffalo, NY, claimed she was actually Johanna Monaghan and at age eight, had been adopted by the Walters family. They had a picture of Joe with short hair wearing masculine attire. Another possibility is the theory that Joe was a Buffalo, NY, debutant who bore an illegitimate son and was disowned by her family. Joe's sister raised the child, Laddie, who grew up to become a lawyer. Either premise is plausible--neither can be proved or disproved. Joe was buried in the local cemetery at the Hat H Ranch near Rockville. She took her secrets with her, leaving us to speculate what made a lovely young woman chose to live and die in one of the roughest of lifestyles. Down Home Ever Lovin' Mule Blues (See the Book Video featuring Justin Saragueta) * Jacquie Rogers * 1st Turning Point * Myspace * Twitter * Facebook * Faery Special Romances Book Video * Royalties go to Children's Tumor Foundation, ending Neurofibromatosis through research.